In coastal Virginia we’re into our fourth month of hot, muggy, wet weather this summer, and the plants are thick and lush. Vining plants are scrambling over every support they can reach, turning shrubs and trees in their path to weird, living sculptures. Grape vines scramble over these trees along the Colonial Parkway. We have nine main perennial vines growing wild along the roadsides and in the edges of our gardens, and one annual vine. All are beautiful, some are useful, and a few are edible. Birds enjoy berries produced by these vines, and so spread the seeds. They crop up, as if by magic, in unusual places. When you find them in your garden you need to decide whether the vine is a gift you wish to keep or a weed to eradicate. Some of these vines, like wisteria, honeysuckle, and trumpet vine, are offered for sale from mail order nurseries and local garden centers. There are multiple species and cultivars for most, and you might choose a hybrid cultivar for your garden which isn’t as invasive as the naturalized species. Ivy scrambling up trees along a pasture at Colonial Williamsburg. Poison ivy is bad news and needs to be eradicated when found in your garden, avoided if found in the wild. Compounds in the sap will give a nasty rash. If burned, it carries in the smoke and can infect you from the inside out with a systemic rash beginning from your lungs. They are attractive vines, produce berries for wildlife, and have some fall color. Many people have them growing up pine trees in their yard and don’t even realize what they are. The rule is, “Leaves of three, let it be” because both of these vines sport a compound leaf of three distinctive parts. Poison Ivy, with three part leaves, growing along with English Ivy and Vinca. English Ivy growing on a Beech tree. Some people love vining plants and are quick to plant them on a trellis, along a fence, or allow several to scramble over a pergola to create shade. They dress up a tree trunk and can be grown as ground cover. 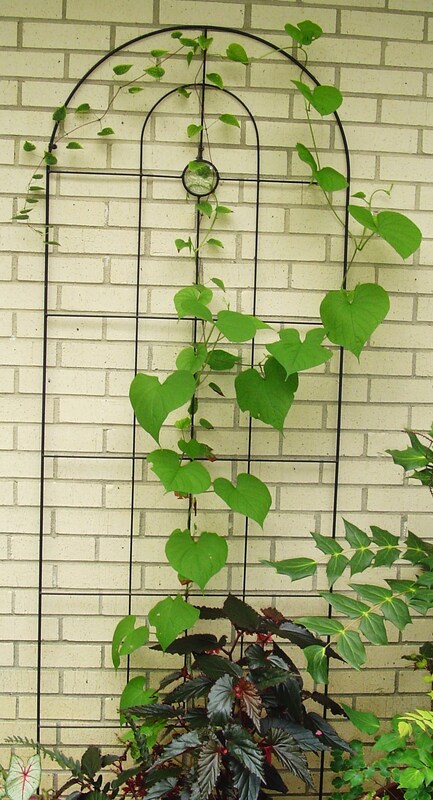 Their prodigious growth makes a vine a good investment for covering a large area quickly. Vines are very useful for screening, for drawing the eye up, and for covering something you don’t want to see. Many bloom extravagantly and attract hummingbirds and butterflies. Other, more cautious gardeners, recognize that vines growing on the exterior walls of a structure can tear it apart. The tiny roots growing on their stems will dig into mortar and grow under and behind the boards of siding. They provide perfect cover for all sorts of insects, which seem to find a way indoors when a house is cloaked in vines. Too many vines will eventually choke and kill a tree. Some, like Kudzu, are highly invasive. Perennial vines with large root systems take over huge areas and crowd out other plants. It is always smart to understand a plant before inviting it into your garden. Just like bringing home a pet or a companion, understand in advance how it will enrich your life, and what problems to watch out for. Observing the habits of vines growing in the wild is a good way to get to know them before inviting them home. 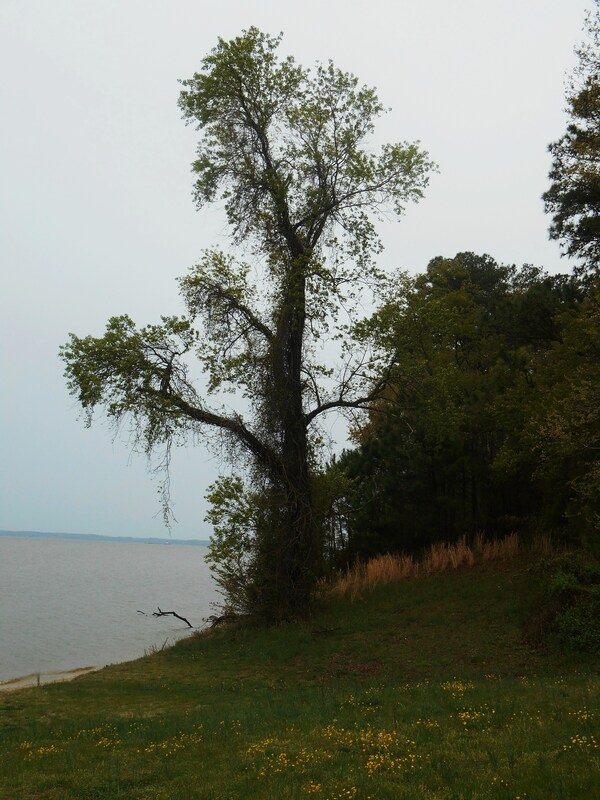 Ivy covers these trees in a county park near Jamestown, VA. Uncontrolled growth like this, where ivy has escaped cultivation, demonstrates why many gardeners avoid planting it and why it is considered invasive. Just keep in mind that vines are all about self-preservation. Many will grow 50′ or more in a single season. They are very tough, cold tolerant, and resourceful. Most will live indefinitely. Get to know them, and then use them to your advantage; or rip them out when they are still small enough to handle. Sometimes a large vine needs to be removed. This is especially true if you realize the vine growing on your tree is actually poison ivy. An established vine will likely be too large to simply “rip out” without heavy equipment, but, it still has its roots in the ground. Use heavy pruners, or a small saw, and cut through the vine’s main stems as close to the ground as you can. The vine will die above the cut. Watch for new growth from the roots, and cut it back as soon as it sprouts. Some gardeners will paint the cut with an herbicide to speed the process. Even if the vine is left in the tree, it will die back and eventually the leaves will disintegrate, leaving only the woody stems. Trumpet Vine and Poison Ivy both try to get a start up the trunk of this Dogwood tree, under a thicket of shrubs. 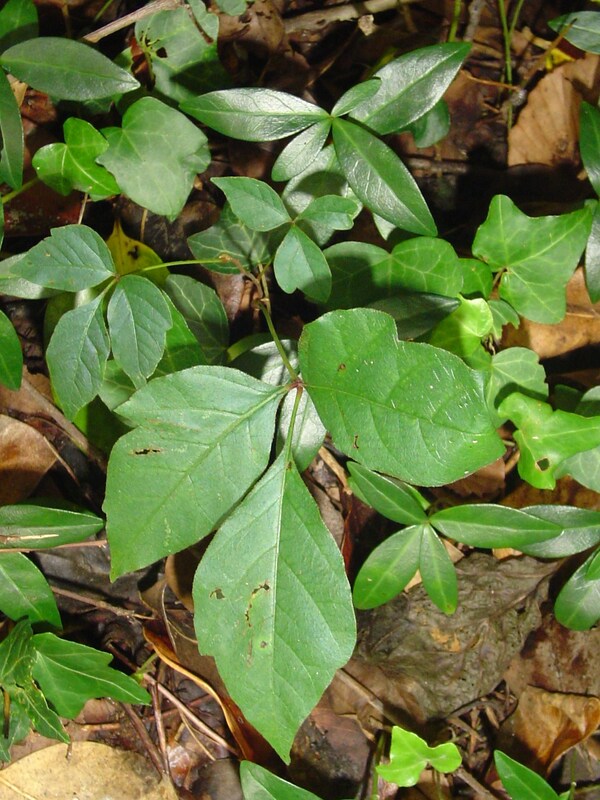 Non-poisonous vines, like honeysuckle or Virginia creeper, can be removed from trees or shrubs in the same way. If a vine is overwhelming its host plant then you will need to cut it back, or even remove it, to protect the host. After cutting a main stem, simply pull the vine out of the host. Many native plant purists will deliver a sermonette, given an opening, on the evils of ivy, which can be invasive. I happen to like it and often add it to plantings to drape and soften the edges of a container. 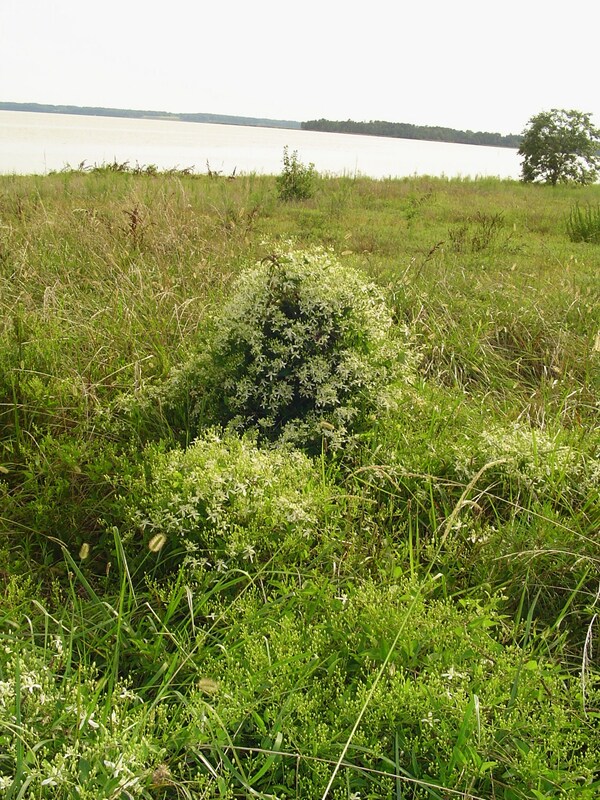 It is naturalized in this area and makes an attractive ground cover. It grows gracefully up the trunks of trees, and some varieties produce berries enjoyed by birds. It is good cover for small creatures, and helps hold moisture. It can be very damaging to a masonry or wood structure. Ivy is native to Europe, Asia, and North Africa. Trumpet vine cloaks the trunk of a pine tree along the Colonial Parkway. Trumpet vine, Campsis radicans is native to North America. It is one of those plants sent back to England by the colonists which became very popular in 17th century Europe. Also called hummingbird vine, the large orange or orangey pink trumpets are much loved by all nectar loving creatures. 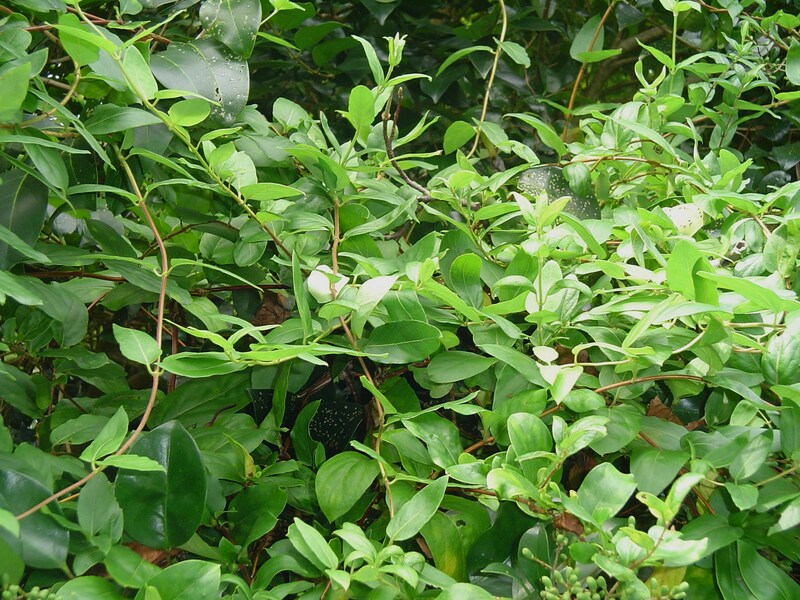 Its medium green foliage is deciduous and somewhat coarse. Never underestimate its vigor. It grows very fast, and can take over a tree in a season. The seeds are enjoyed by birds and small animals. Trumpet Vine is a favorite of hummingbirds. Birds enjoy the seeds. This native vine is most beautiful in late summer. Honeysuckle, Lonicera species, has a wonderful sweet fragrance when in bloom. Children pick the individual flowers to taste the sweet drop of nectar had by pulling the pistol back through the flower. There are over 100 species, with various ones native to each continent, including North America. Loved by hummingbirds, butterflies, and many insects, Honeysuckle also produces berries for the birds in autumn. The thickets of woody branches are prime nesting sites for many birds. Honeysuckle can easily cover arbors, walls, trees, and shrubs and can be used ornamentally in the garden. It may also become invasive and choke out its living host shrub or tree because it spreads out and covers its support to get maximum sun. The woody stems can be woven into baskets or wreathes. Honeysuckle vines grow through a Ligustrum shrub, offering nectar, seeds, and shelter to wildlife. Virginia Creeper, Parthenocissus quinquefolia, is an ornamental, woody deciduous vine. Often mistaken for poison ivy, I always count the leaves before touching it. Virginia Creeper, native to North America, has a compound leaf with five sections, like a hand. Some of its leaves, however, may only have three sections. 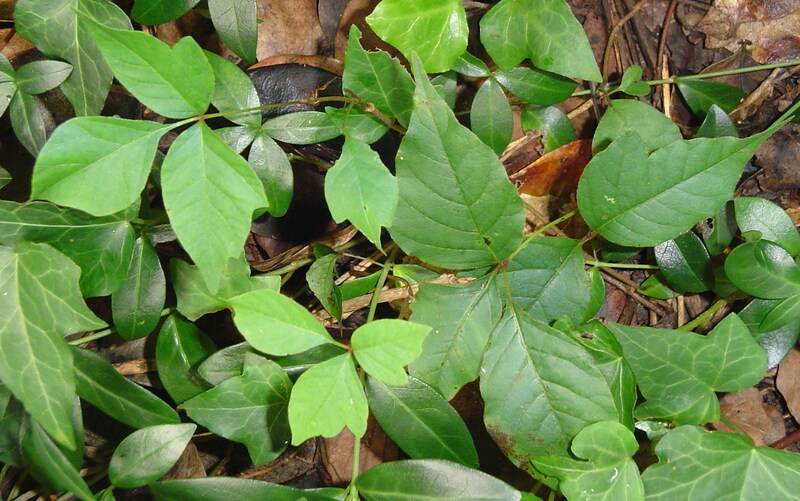 It is best to look closely before yanking it out to identify whether you are dealing with creeper or Poison Ivy. This vine scrambles up trees, through bushes, and across the ground. Virginia Creeper turns bright scarlet in the fall, and puts on a spectacular show for a few weeks as the trees begin to turn color in October. Sweet Autumn Clematis Clematis terniflora blooms extravagantly in late summer and autumn. 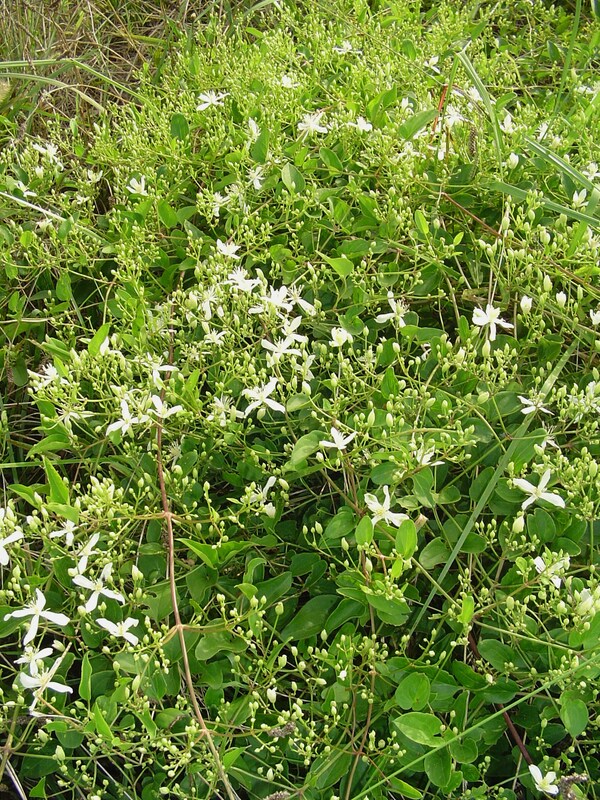 Its small white flowers cover large, woody deciduous vines which grow to 30′. Sweet Autumn Clematis has begun blooming along the Colonial Parkway. Sold by most nurseries and garden centers, it has also naturalized in many areas. This is the lightest and shortest of the vines in this list. Each vine produces thousands of seeds annually, and so it may quickly become invasive. Autumn Clematis, which has naturalized because birds enjoy its seeds, is a relatively small, light vine. It still grows to completely cover its support and get maximum sun for itself. Kudzu, Pueraria lobata, native to Japan and southeastern China, was introduced to the United States at the Centennial celebration of 1876 in Philadelphia. Kudzu is an important and useful plant in Asia. A member of the pea family, it has a beautiful spring bloom followed by a seedpod. It has a high nutritional content and is used as fodder. Its root is dried and ground into a starch used in Asian cooking, and other parts of the vine are edible. It is used in herbal and Asian medicine. This woody deciduous vine fixes nitrogen in the soil, its taproot brings minerals up to the soil surface, and its rapid growth makes it useful for erosion control in areas recently cleared or burned. It improves the soil, and makes great compost. The woody vine is excellent for making baskets, wreathes. Its fiber is used in making paper and fabric. Current research continues to look for new uses for this versatile vine. Kudzu covers everything along the side of Jamestown Road in certain spots. 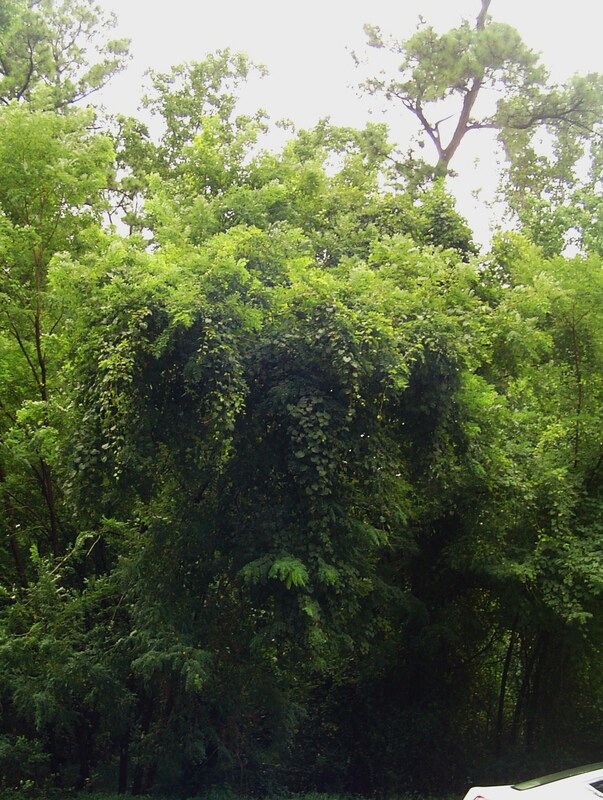 Kudzu is maligned in North America as a noxious weed because of its extremely rapid growth. It clambers and crawls over whatever trees or shrubs are already there, shading them out, virtually killing everything in its path. There are huge “kudzu forests” all around this part of Virginia where kudzu blankets acres of land, covering everything. New growth of Kudzu twists around anything, even itself, looking for support. Here it is growing out into the roadway. Kudzu has a deep and extensive root system. To eradicate it, you can cut the vines, but must also remove the crown to prevent re-growth. Kudzu spreads by seeds, underground runners, and its stems easily root wherever they touch the ground. 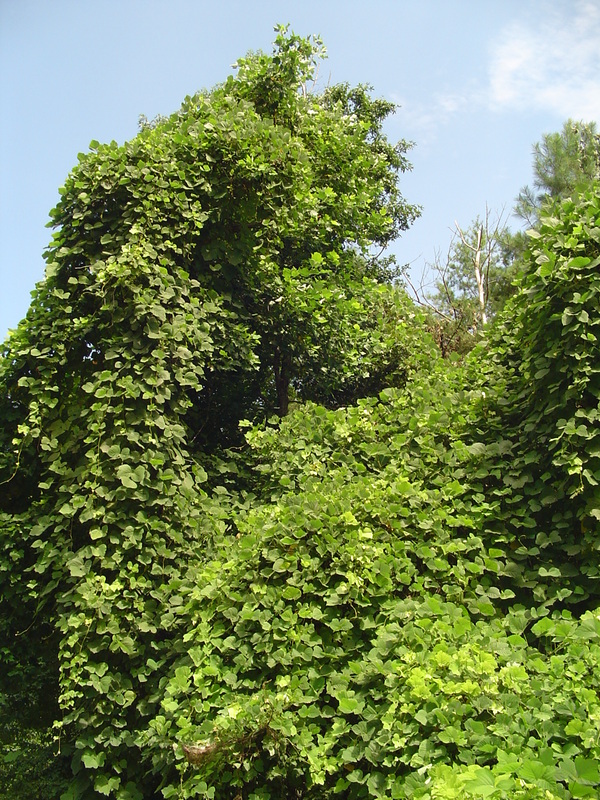 Removing kudzu, once established, requires patience, persistence, and a lot of work. Wild, or “Fox” grapes growing along the Colonial Parkway. This native grape is a parent of many popular American hybrid varieties. Wild Grape or Fox Grape, Vitis labrusca, is the native North American. Although a different species from the European grape, the native North American grape is edible and useful in making wine. It has a strong sweetly musky aroma, which was described as “foxy”, thus the term “fox grape”. Many popular American hybrids have been created from V. labrusca. 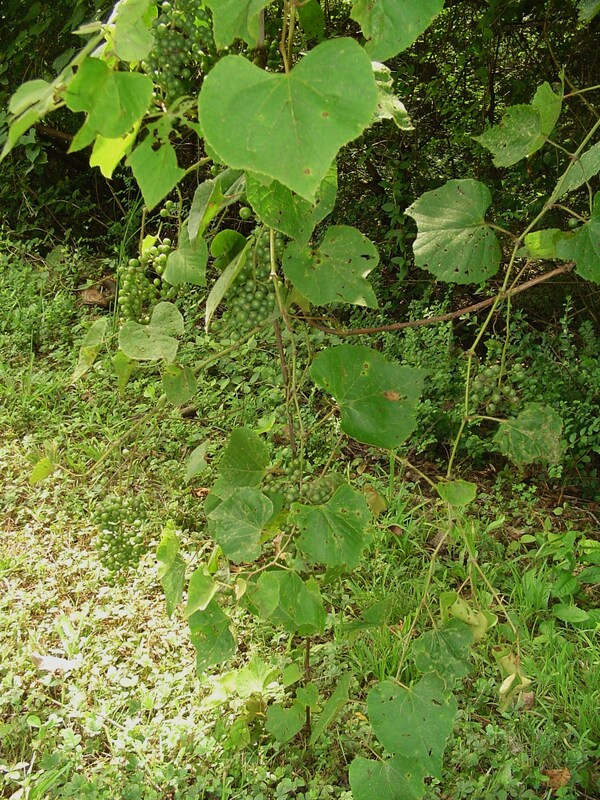 Vines growing in the wild provide secure shelter for many birds and insects, and the ripened grapes are quickly eaten by birds and other small animals. “Leaves of three, let it be”. Poison Ivy growing in the edge of my garden. Poison Ivy Toxicodendron radicans, may appear as a vine growing up trees, as a ground cover, or as a small shrub. It isn’t a true ivy, but rather a deciduous woody vine native to eastern North America. It is easy to identify because its compound leaves always have three distinct almond shaped parts, connected to the main vine by a small stem. Its vine has a “hairy” appearance. The leaves have good fall color from yellow through bright red. 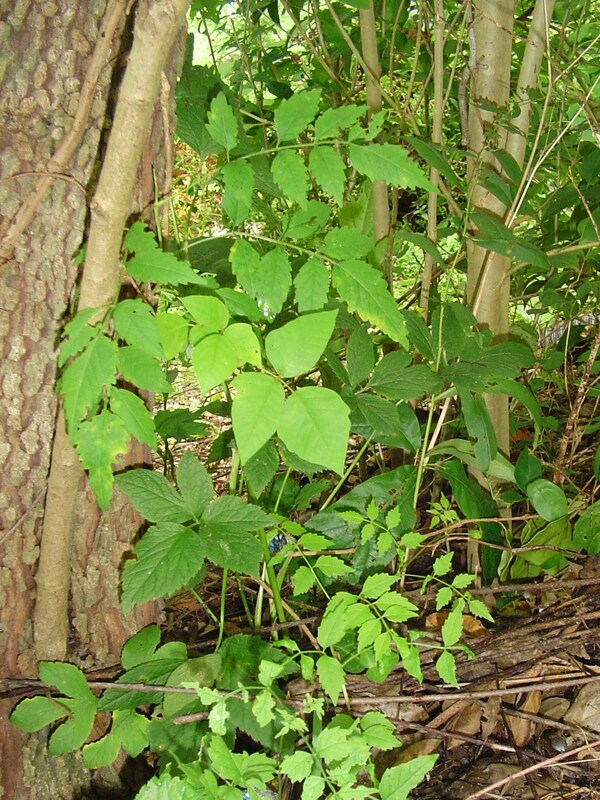 Poison ivy is found in areas along the edges of woodlands, in disturbed areas, and often in suburban yards. Birds spread seeds from the berries it produces each autumn. Its sap contains urushiol, which causes a form of contact dermatitis when it comes into contact with the skin. The painful, itchy rash and blisters from touching poison ivy can vary from minor to severe. 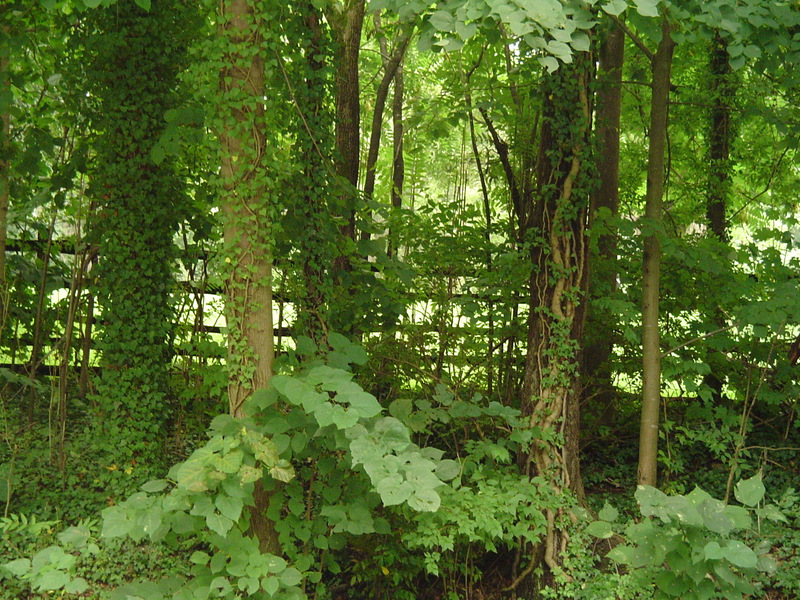 Recent research from the University of Georgia proves that poison ivy is sensitive to CO2 levels in the atmosphere. Increased levels of CO2 have doubled its growth, and made its urushiol content more potent, since 1960. To avoid a rash, wear long pants, long sleeves, socks and gloves whenever poison ivy contact is a possibility. Eradicate small plants by cutting the stem near the ground. Never burn it as the toxin in the sap can also travel in the air, infecting the lungs and creating a far more serious condition. Poison Oak grows only in western North America, and so one need only watch for Poison Ivy in Virginia. Wisteria frutescens is the species of Wisteria native to southeastern North America. 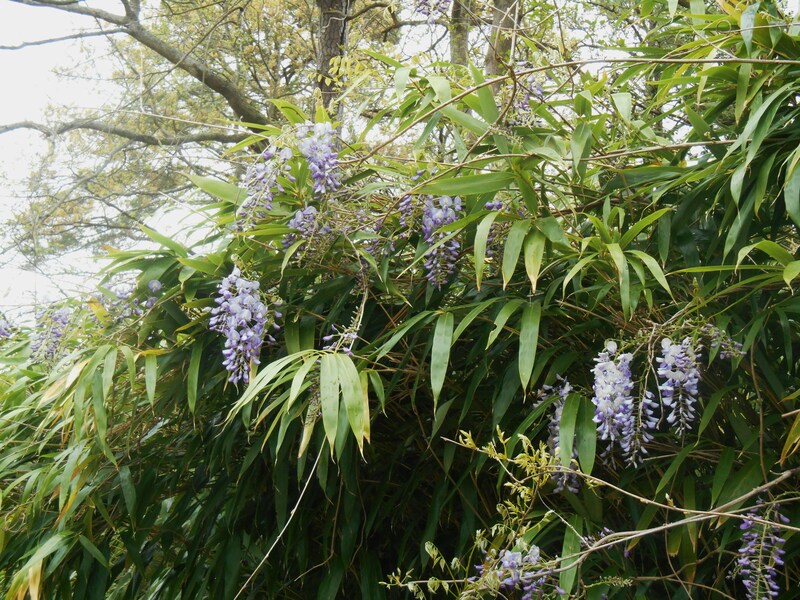 It reaches about half the size of the Asian Wisteria species, and its flower racemes reach about half the length of other species and cultivars. Another member of the pea family, like Kudzu, Wisteria has beautiful flowers, but is considered invasive in many areas. It grows quickly to cover whatever trees, shrubs, or structures are in its path, twisting its stems around any available support. This heavy woody deciduous vine can easily tear apart lightly built pergolas, fences, porch rails, etc. where it takes hold. It can eventually shade out and kill trees on which it is growing. Wisteria growing along the Colonial Parkway near Jamestown. Blooming in late spring with long racemes of white, lavender, pink, or purple flowers, it is beautiful hanging from the tops of trees or along well built trellises. Its seeds, produced in a pod, are appreciated by wildlife. It may take 20 years for a vine grown from a seed to produce flowers, so new plants in the nursery trade are started from cuttings. Wisteria needs full sun and moist soil. Like kudzu, it improves the soil where it is growing by fixing nitrogen on its roots and bringing minerals from deep in the soil to the surface on its roots. 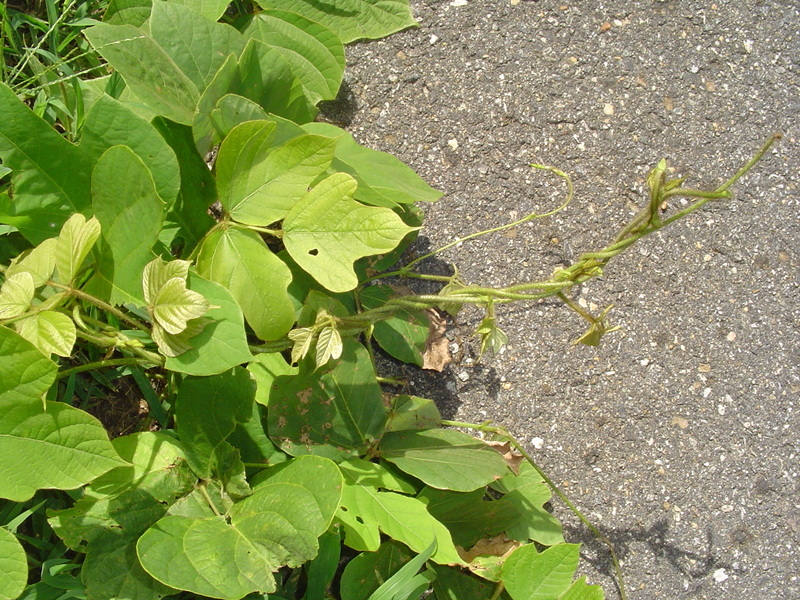 Unlike Kudzu, all parts of the plants, especially the seeds, are poisonous. Moon Flower, an Impomoea, shares a trellis with a Clematis vine. Bindweed or Morning Glory, (Convolvulus, Impomoea, and other Genera in the family Convolvulaceae) are annual or tender perennial herbaceous vines. They begin to flower in mid to late summer, blooming at night or around dawn, and closing again by mid-day. Although many gardeners plant morning glories as flowering annuals in their gardens, once established, some varieties can become an invasive weed, choking out and shading other plants. Morning glory is seen on roadsides growing as a ground cover or on small trees and shrubs. Blooming in shades of white, red, pink, lavender, and various shades of blue, morning glory flowers resemble petunia flowers. They are very vigorous, tolerate poor soil, and enjoy full sun. The stems grow around and around whatever support the plant is climbing, earning the name, “bind weed”. These plants are grown for their flowers and for the summer shade cast by their large leaves. Some varieties are edible. The dried and ground seeds of some Impomoea cultivars were used in parts of Mexico and South America as hallucinogens, similar to LSD. Birds enjoy morning glory seeds, and help spread the plant in the wild. These vines can be controlled by pulling them out of the ground, although once established, their seeds will continue to sprout each year. Morning glory vines scamper over roses and Lantana. Vines are in season this time of year in Virginia, growing extravagantly; making weird sculptures in the landscape as they scramble over trees and crumbling structures. They produce flowers; provide shelter and shade, feed wildlife, and some produce edible fruit. In a few weeks, as the days grow cooler, many will turn a rich scarlet or bright yellow, adding to the autumn show. Invite vines into your garden with caution, but always appreciate the gifts they offer, especially to wildlife. I live in Az and would love a vine that would grow on my aging trees that also bleed out a substance that stains my steps. Vine Covered Trees was one of my first posts to Forest Garden in the first year of this website. It is one of the most viewed pages every month, still. Winter is a great time to work with the vines growing in our garden. We can see the stems of deciduous vines and prune as needed, or pull them out of the trees where they are growing through the canopy. That is on my own ‘to do’ list this month, as a matter of fact! I’ve just updated this post and added a few new photos. I hope you will find it interesting and useful, especially if you garden in our part of the country where vines are rampant and sometimes predatory…. Hi, I appreciate the technical article! We moved to a new house in Tampa FL and I am having trouble identifying what is taking over my yard. Literally. I think it’s kudzu, but I’m not completely sure. I have three grand trees, gorgeous and am concerned for their viability. The vine eradication method we deploy cannot damage these trees. I have one tree that is on its way to being vine covered. Yikes! Is it possible for me to send you pictures? This could be a Virginia creeper. I need to rule out poison ivy as well. Your help is greatly appreciated!! Of course, Janet- I would be happy to take a look at photos to see whether I recognize the vines. There in Zone 10? you likely have vines that we don’t, here in VA, but many common vines grow all along the East Coast, including FL. If I can’t identify your vine, I’ll post the photos and see if any visitor to Forest Garden recognizes it, OK? A good way to eradicate vines remains to cut them. Cut them in multiple places, but also as close to the ground as you can get. Cut off the roots and the vines will wither. DON”T pour herbicide on the roots as you’ll likely kill your tree as well! I moved from Miami and now in Greensboro, NC. Seems to my my vines on trees in back yard are sucking the life out or trees and limbs and trunk dying on some. Are vines parasites killing the host tree ? Hi Carl, wonderful to hear from you! I know just what you mean about vines hurting their host trees. Some vines appear to be parasites, with their aerial root systems sinking into the bark. But they aren’t tapping into the tree’s food supply. Those roots are only seeking water. But they can choke the tree out by shading the leaves. Many of our native and naturalized vines have broad leaves, catching the available sunlight before it can nourish the tree. They also hold moisture against the bark, encouraging insects to colonize and allowing for rot. Their weight often breaks off weakened limbs, leaving a wound where rot can grow. Some vines, like poison ivy, Virginia creeper (looks nearly the same, but 5 leaf sections together) and trumpet vine have their roots firmly in the ground. They may have sunk little white or brown root looking things into the bark for stability, but you can kill them by cutting the vines at the base. Cut off from their roots they will wither and die. Carl, please be very very careful if you determine a vine is poison ivy. The chemicals which cause skin and lung reactions are active even once the vine looks dead. Whatever you do, don’t burn the vine! The harmful chemical will go airborne and do nasty things to whomever breathes it. That happened to me when there was a huge fire in the Dismal Swamp a few years back while we were still in VA Beach. We were breathing the smoke for weeks- and I got a systemic reaction to the burning poison ivy. 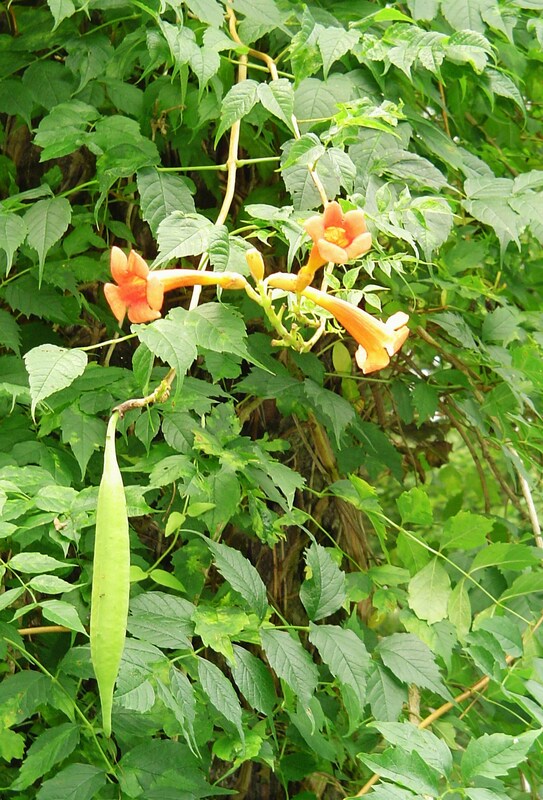 If your vine blooms orange, it is trumpet vine and not poisonous. I know you will recognize English Ivy (and it’s evergreen) and that is perfectly safe to handle. Birds love the berries produced by all of these vines 😉 If there is no ‘vine,’ only a clump of vegetation high in the tree then you have mistletoe, which roots only into the tree itself. But while it may soak in moisture, it isn’t using the tree’s food for its own growth. Any green plant is of course producing its own food from sunlight. So your answer here is yes, no, maybe…. The only vine I always try to kill is poison ivy. We like the English Ivy for its green shining leaves all winter. 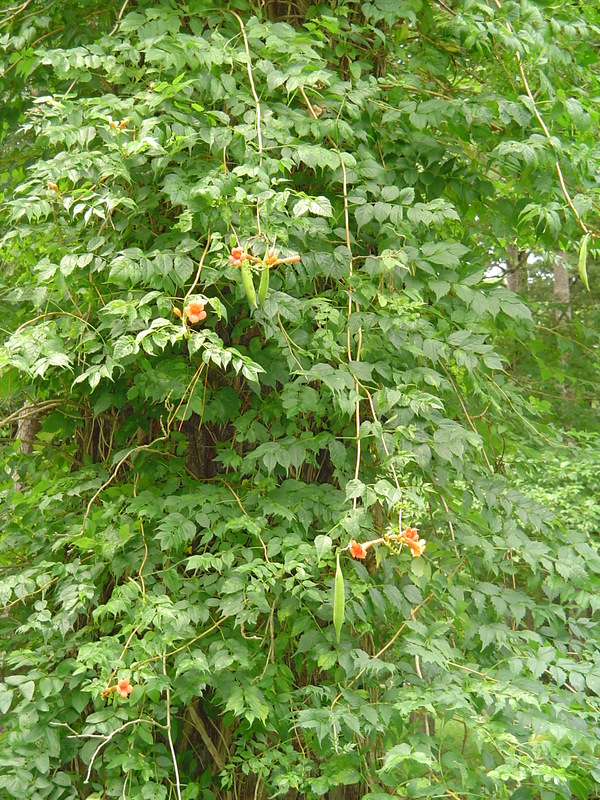 Trumpet vine looks great all summer, though it will destroy small trees with its weight. Oh, I did the poison ivy suffering. Rubbed my eyes and nose so got rash, eye area swelling besides and arms and chest. Took 4 weeks to go away even with doctor prescribed cream. help i owned a nursery and am familiar with all kinds of plants . this vine grows like wild grape covers grows through trees etc. not like virginia creeper climbing trunk of trees this came from arkansaw? leaves like small maple 2 in.by 1 in side side leaflets across from each other leaves red orangered in summer. underground runners. i told friend to cut about 4 in above ground and put poison ivy kill or ground clear on stem to kill she needs help getting rid of this nasty thing no flowers she says. I’m so glad that we don’t have kudzu here in New Hampshire!